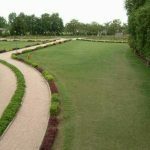 Botanical Garden Surat is popularly known as “Sneh Rashmi Botanical Garden”. This pleasant garden is located on the bank of river “Tapi” in the “Ugat” area of Surat. Surat is one of the largest cities of Gujarat and well known as a “Manchester Of India”. If you are in search of a quiet and peaceful place in this crowded city then Botanical Garden Of Surat is the perfect choice for you. This tranquil place is the habitat of more than 1000 plant species. Nowadays it became one of the most visited attractions for tourist and residents. Lush green garden, Helium Balloon, Toy Train these are some attractions which are attracting many visitors, especially children. Visitors can visit this beautiful garden every day (Except Monday) between 10:00 AM to 10:00 PM. On every Monday it remains closed for maintenance. Festival season and public days may affect the time. Visitors required 2-3 hours to explore all the attractions inside this botanical garden. Address: Sneh Rashmi Botanical Garden, Ugat – Bhesan Road, Ugat, Dahin Nagar, Surat, Gujarat 395005, India. Visiting Hours: 2-3 Hours required. Senior Citizens (Above 64 years): Rs. 5 per person. Primary & Secondary Students: Rs. 2 per student. Camera Charges: Rs. 5 per camera. Note: There is free entry for child below 5 years and disabled people. How To Reach Botanical Garden Surat? By Road: S.M.C. Botanical Garden bus stop is the nearest bus stop and it is situated at the distance of 200 meters from the garden. Apart from bus transport, you can use private or public transport services. Surat is the big city and private cab providers like OLA and UBER are providing their services here. 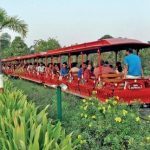 By Train: Surat railway station is the nearest railway station from the garden and it is around 8 kilometers from this botanical park. Surat is well connected with all the major cities of India by train route. By Air: Surat airport is the nearest airport and it is located at the distance of 17.5 kilometers from the garden. September To February is the best season to visit here. Try to avoid visiting in the afternoon during summers. This place is popular as a weekend destination or one day picnic spot. Always keeps your Cap, Water Bottle and Glasses with you. Sneh Rashmi Botanical garden was built in the year 2011 in the budget of rupees 6.85 Crores. It was inaugurated by former chief minister of Gujarat Mr. Narendra Modi on 25th January 2011. Park has spread over the large area of 1.40 lakh square meter, which made it as the biggest garden of Surat. It houses over more than thousand species of plants which includes some rare, herbaceous, ornamental plants. Every month over 20,000 people visit this place. There is small serene lake present in the middle is another highlight of this garden. This botanical garden has Gujarat’s one of the largest collections of tropical plants. The park is also known for artistic creation. Greenhouse built using a cactus popularly known as a “Cactus House” is a good example of artistic creativity. You can use the toy train ride which will give you a glance of a botanical garden. It is the ultimate destination for photographers. There are a number of adventurous rides like Free Fall Tower, Crazy Jump, Octopus, Rocket Space, Columbus, Injector are available inside the park. But the main attraction is Helium Balloon. It is really amazing experience and gives the most picturesque view of Surat city from the balloon. There are some other rides for children below 10 years. You need to pay extra charges for all these rides. Food stalls and small restaurants are also present inside this botanical garden. Nowadays this place became the most famous picnic spot. One can easily spend some quality with his family or friends. The park is maintained by Surat Municipal Corporation (SMC). Now SMC trying to upgrade it by including some more rides. They are also trying to increase the parking space, as current parking space is too small. This place is the perfect combination of amusement park and nature park. In our suggestion, this is definitely a must visit place in Surat. So if you are in Surat then try to visit at least once.